Little, Brown & Co., Essex, UK, 2004. There are lots of different ways to be a family. Your family is special no matter what kind it is. 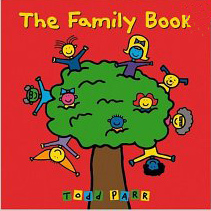 With Todd’s distinctive bold drawings and easy writing style, this book is great for helping people of all ages celebrate the diversity of the families around us. The Family Book has been very positively received by many audiences. Among Todd’s other books, I would also recommend It’s Okay to be Different, which focuses on self acceptance and specifically mentions it’s okay to have two moms or two dads, or to be adopted. There are lots of different ways to be a family. Your family is special no matter what kind it is.